Image: Richard Cartwright, Mitch Haaseth/ABC. The historic 15th season of Grey's Anatomy will be premiering in September, and there's going to be lots of changes, from the plot to the casting. It looks like the new motto on Grey's is "Out with the old and in with the new" — and that includes the kinds of romantic storylines that will take center stage. In a new interview for The Hollywood Reporter, Grey's costars Kevin McKidd (Owen) and Kim Raver (Teddy) sat down to discuss the love triangle that their characters — along with Amelia, played by Caterina Scorsone — will be getting into in season 15. Owen and Teddy had a brief fling that resulted in Teddy getting pregnant with Owen's baby, but things will only get more complicated now that Amelia is back in the picture thanks to Owen's desire to rekindle their romance. On this, Raver said, "The interesting love triangle that's probably going to happen is going to be very different from the typical love triangle" because it will be sensitive to the irksome trope of women competing against each other for a man — a great way to seem annoyingly old-fashioned in the #MeToo era. "We're in 2018 and I pitched, if we can, not having woman pitted against woman. Amelia and Teddy definitely have what they want, but maybe there's a different way to approach it," Raver continued. And in McKidd's opinion, the Teddy-Owen-Amelia triangle is going to be complex and intriguing to watch (and discuss ad nauseam with your friends once the credits roll on each new episode), not only because Teddy and Amelia won't be fighting for precious resources (read: Owen) but because it will show how actual adults handle these situations. "Owen and Teddy and Cristina had a very intense, slightly juvenile love triangle," McKidd explained. "What they want to do [now] is show people who have histories and have feelings. 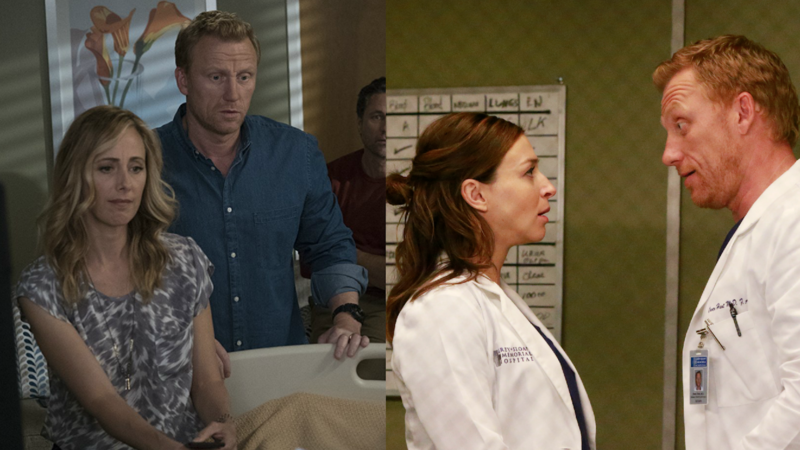 All three of these people [Owen, Amelia and Teddy] have a lot of baggage and history with each other. And there's children involved, which is a responsibility. It's not just young people going, 'I love you… I don't know who I love.' They're grown-ups now. It's going to be interesting to see how people navigate this pretty murky and difficult and challenging news." We're even more excited for season 15, which premieres on Sept. 27.